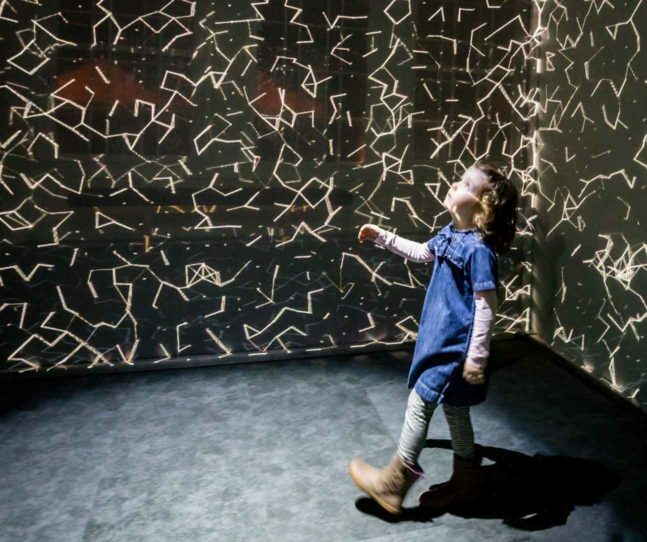 Next time your child complains about math and demands to know: “When will I ever use this stuff in the real world?” we have an example to offer. To determine the number of balloons needed for the PlayTime installation, PEM staff had to calculate the total cubic volume of the designated space — 6,639.56 cubic feet. They had to divide that number by 2 and then divide that number by the volume of a single 16-inch balloon. Still with us? The final answer: 2,213 — which is how many balloons occupy this oversized ball pit for grown-ups and kids alike. The artist was very specific about the calculations — how much air goes in the balloons, what color balloon, what brand of balloon,” said Francesca Williams, PEM Registrar for Exhibitions. This immersive pink balloon experience, officially called Work No. 329, is a variation of Martin Creed’s Half the air in a given space, and, as the title suggests, requires that half a room’s entire volume is filled with air-inflated balloons. 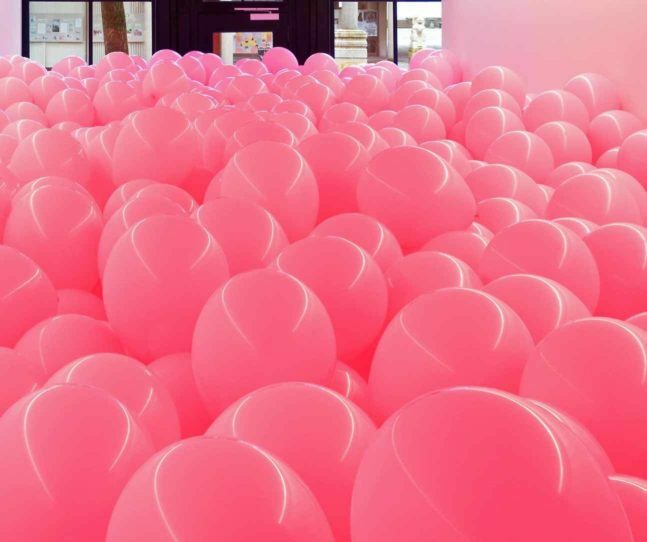 Visitors to PlayTime are immediately invited to walk or wade through this room filled five feet high with pink balloons. Gallery Interpreters in bubblegum pink T-shirts are on hand to enhance the experience and also return any balloons that escape. Six people can enter the installation at any time, and shoes are allowed with the exception of stilettos. Recognizing that some uneasiness is a possibility for the claustrophobic-prone, the interpreters will watch for anyone who might need assistance. Note: There is a second way to enter the exhibition should a person want to bypass the balloons altogether. Balloonatics, a business based in Saugus, is providing the balloons. Owner Bob Brenna estimated it would take a full day and staff of eight to inflate and hand-tie 2,213 balloons. The company has experience with big orders, having worked on the movie sets of Grown Ups 2, Central Intelligence and The Finest Hours. On New Year’s Eve, they prepped 5,000 balloons in one day. This is our first time working with a museum,” said Brenna. “Should be a lot of fun. Every three weeks the installation is de-installed, which means PEM staff will don ear plugs and a sharp instrument to pop them all. 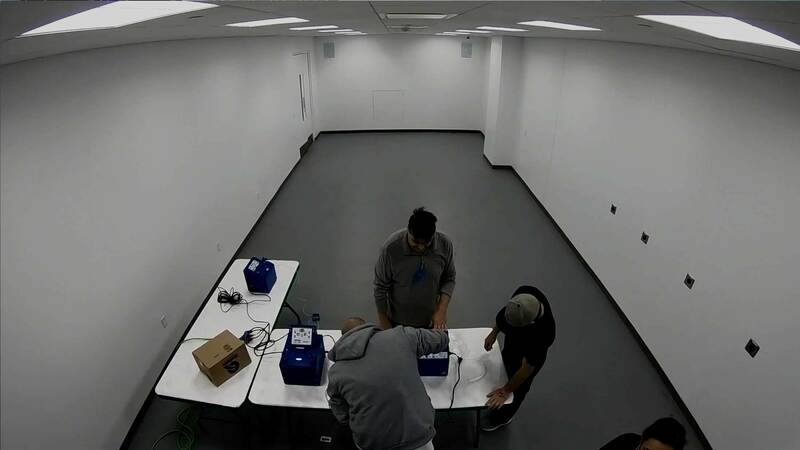 Balloonatics staff will return with their precision inflators to create a fresh batch. Interpretation Planner Liz Gardner said she experienced a similar installation of Creed’s work several years back. Initially she felt a little unnerved, enveloped by this sea of balloons. But she soon embraced the silliness of the situation and safely “swam” to the other side. 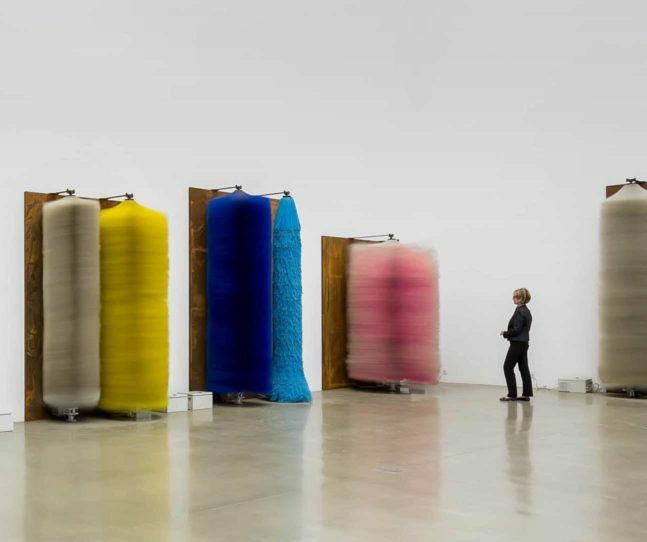 I think it is very exciting we are starting the exhibition this way,” said Gardner. “It’s a fun way to shake things up.